The most recent edition located behind the Service Desk on the ground floor of Hillman Library. Copies are also available in some departmental and all regional campus libraries. Visit 250 Millstein Library to have your writing reviewed. APA (American Psychological Association) Style originated in 1929, when a group of psychologists, anthropologists, and business managers convened and sought to establish a simple set of procedures, or style rules, that would codify the many components of scientific writing to increase the ease of reading comprehension. "The potentially contradictory nature of Moscow's priorities surfaced first in its policies towards East Germany and Yugoslavia," (Crockatt, 1995, p. 1). Film Greene, C. (Producer), del Toro, G.(Director). (2015). Crimson peak [Motion picture]. United States: Legendary Pictures. A brief tutorial on the basics of APA citation style. This section provides a quick resource for citing references in papers using the 6th edition of the Publication Manual of the American Psychological Association (2009). 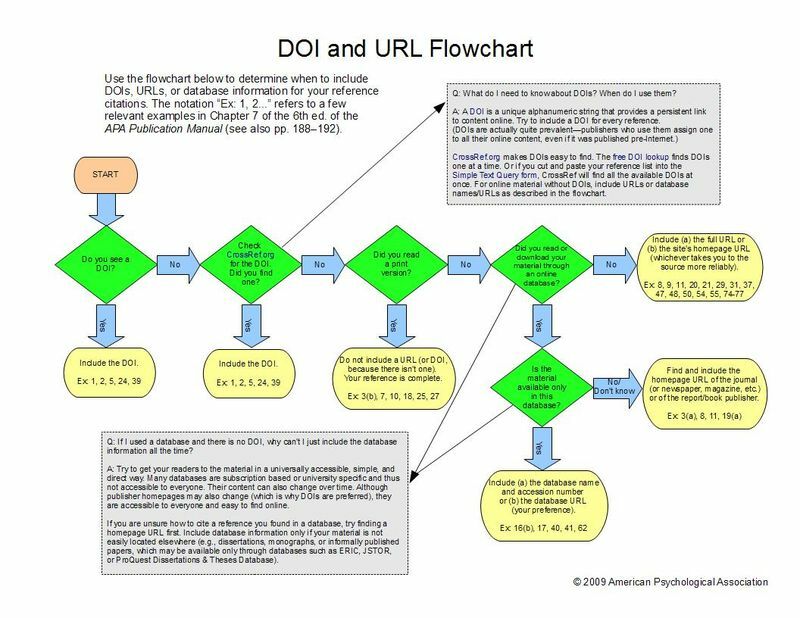 In order to simplify when to use a DOI (Digital Object Identifier) and a URL (Uniform Resource Locator) in your citations, APA published this flow chart.